Caminar a través de la puerta de la Suite 1405 y la primera cosa que se nota es la hermosa vista del océano a través de la puerta corredera de cristal. En el área principal es de dos camas de matrimonio, armario con TV de pantalla plana y dos sillas de lado para su comodidad. La cocina cuenta con microondas, estufa y cocina con mesa y sillas que el asiento 4. Al entrar en el cuarto de baño y tiene un gran armario y lavabo con ducha separada. Otras aventuras a considerar están llegando a Cancún durante el tiempo en que las tortugas marinas ponen sus huevos o cuando la escotilla bebés. Este periodo de tiempo es desde junio hasta octubre. Avistamiento de tiburón ballena es julio y agosto. 100% de reembolso para cancelaciones con más de 60 días antes de la fecha de entrada. 50% de reembolso para cancelaciones con más de 30 días antes de la fecha de entrada. We loved this location in the hotel zone; it was a quick shuttle ride from the airport, and a quick taxi ride back. It was easy to get around without a car because once in the hotel zone buses and taxis are very convenient to use. All communication, and linking up upon arrival went very smoothly. 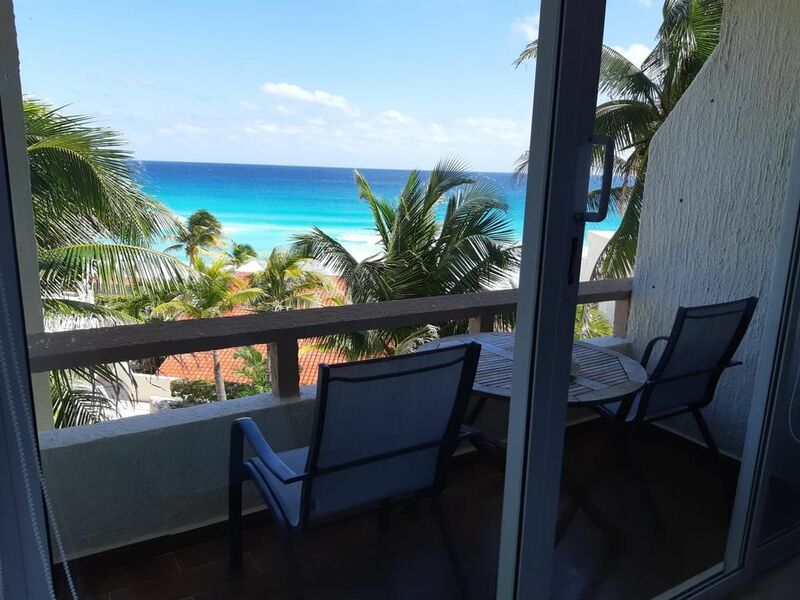 The property has beautiful views, looking straight out on the ocean; we enjoyed using the covered balcony and also the direct access right on to the beach. The kitchen had everything we needed to prepare light meals, and we really appreciated the ample bottled water. Other than that, Mrs Lincoln, how was the play? Specifically the hotel bar was under my balcony playing drum or rap or hip hop music from 11am to 11pm. Not every minute of every day but enough to be annoying. Overall impression was wonderful! Very nice and well kept place. Both Miriam and Lynette were wonderful! We dealt with Miriam more as she was the one who showed us our place when we arrived. She was great! She had a map to show us places to go and visit. As well, Miriam gave us suggestions as places to go and eat. She was very accommodating! I would highly recommend staying in this suite. We thoroughly enjoyed staying in Condo 1405. The room was neat, clean, and very comfortable. The view was magnificient. Miriam was wonderful, she welcomed us, and made sure we had all of the information we needed to make our stay fun! We would definitely stay there again. Beautiful views and great access to the beach!! Very nice place to stay and great for walking on the beach and enjoying beautiful sunrises. Access to food on property is very limited so you need to take the bus for local restaurants ; the bus is easily accessible. The condo is as described and very nice. Ac kept the place super cool and everything was perfect. View from balcony is gorgeous. Miriam was very very helpful, always had the answers to all of our questions and responded in a matter of minutes. I do have one suggestion to travelers from the US, do a currency exchange before you go because we found that a lot of restaurants and stores are not exactly honest when converting dollars to pesos while making change for purchases. It seems they set their own exchange rates, especially restaurants. This, of course, has nothing to do with the condo rental. If u want a nice quiet, relaxing vacation with a person who will give you guidance when needed, then you need to rent this condo and meet Miriam. Esta propiedad se encuentra en el extremo sur de la Zona Hotelera. Convenientemente situado a muchos restaurantes ya unos 15 minutos de viaje de la zona de fiesta.